Thanksgiving week will see just a few days of political activity, but the beginning of the week is looking busy. Highlights include closing arguments in Sheldon Silver's corruption trial; the continuation of Dean Skelos' corruption trial; the release of the Public Advocate's "worst landlord list"; several City Council hearings and a full-body "Stated Meeting"; two public meetings of the city's commission on elected official compensation; and more. See our day-by-day rundown below. Two New Reps Set to Join the City Council - get to know Joseph Borelli and Barry Grodenchik, who just won special elections and will join the Council soon. As Homelessness Crisis Continues, Shelter Siting Questions Intensify - with dozens of new homeless shelters opening, are they being distributed around the city fairly? are communities being given enough notice? Mayor Bill de Blasio had no public schedule Saturday. On Sunday, the mayor, NYPD Commissioner Bill Bratton, FDNY Commissioner Daniel Nigro, and U.S. Secretary of Homeland Security Jeh Johnson observed "an active shooter drill in Lower Manhattan." After that, the mayor was delivered remarks at Church of God of Prophecy in the Bronx, where he was hosted by City Council Member Vanessa Gibson, among others. On Monday, de Blasio "will deliver remarks at the groundbreaking ceremony for Hunter's Point South Phase II" at noon; "host a press conference to make an announcement related to mental health" with First Lady Chirlane McCray at 2 p.m. at CUNY Hunter College - Silberman School of Social Work; and hold a media availability at about 3 p.m. nearby the school. At 10 a.m. the Committee on Public Safety and the Committee on Transportation will meet to hear the introduction of several bills regarding unmanned aviation vehicles (drones). They will focus on regulation, registration requirements and authorization of use. At 10 a.m. the Committee on Youth Services will meet to discuss several new bills that would require training for certain employees in treating runaway, homeless, and sexually exploited youths, and amend the requirement date for the annual report on sexually exploited children. At 1 p.m. the Committee on Education will meet for oversight on Department of Education’s efforts to help struggling schools. Schools chancellor Carmen Fariña will testify. At 1 p.m. the Committee on Civil Service and Labor will meet to hear a series of new bills that would require successive employers of buildings to retain workers for a transitional time period and extend protections for displaced building service workers to food service workers. At 1 p.m. the Committee on Environmental Protection will meet to hear a new bill that would require the identification of geothermal systems and buildings eligible for them, as well as registration for the people allowed to install such systems. On Monday at 8 a.m., The Food Bank for New York will release a new report on the state of hunger and food networks in New York City. The “legislative breakfast” and report will examine the effects of federal cuts to SNAP cuts. Margarette Purvis, President and CEO, Food Bank For New York City; Steven Banks, Commissioner, New York City Human Resources Administration; Triada Stampas, Vice President For Research & Public Affairs, Food Bank For New York City, and “elected officials from throughout New York City” are expected. At 8:30 a.m. The Manhattan Chamber of Commerce and Business Forward will host a business leader forum to discuss the effects of severe climate change on the restaurant industry. At 9 a.m. Monday in Long Island City, City Council "Majority Leader Jimmy Van Bramer will be joined by several New Yorkers who have applied and have not been selected for a variety of the City's affordable housing development lotteries throughout the five boroughs. Together, Council Member Van Bramer and these New Yorkers in need will express why they believe Airbnb needs to be held accountable for allowing tax-subsidized affordable housing units to be posted as illegal hotels on their website." Later, Van Bramer will join the mayor for the aforementioned Hunter's Point groundbreaking. At 11 a.m. in Foley Square, Public Advocate Letitia James "will hold a tenant rally and release the 2015 Worst Landlord Watchlist. Following the rally, Public Advocate James will visit Brooklyn Housing Court to ensure tenants are aware of their rights and then tour one of the buildings on the Worst Landlord Watchlist.". At 11:15 a.m. Monday, State Senator Liz Krueger, together with community leaders and elected officials, will gather at the City Hall for a press conference which will urge Governor Andrew Cuomo to transition New York off of coal power by 2020. Senator Liz Krueger will be joined by State Senator Brad Hoylman; Assembly Members Brian Kavanagh, Rebecca Seawright and Jo Anne Simon; and City Council Members Donovan Richards and Dan Garodnick. 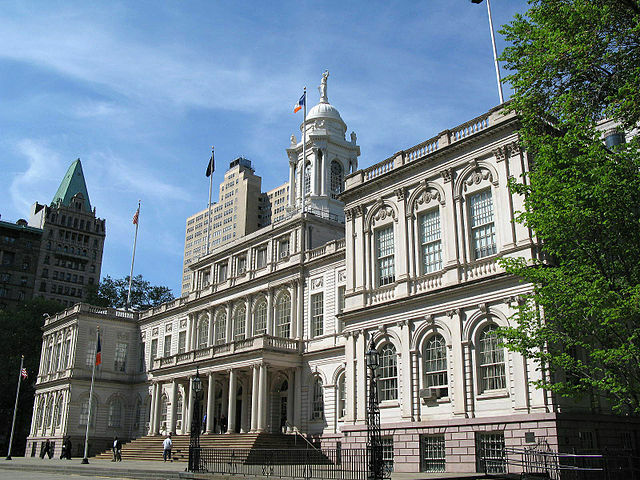 At 12:45 p.m. Monday, City Council Member Ydanis Rodriguez, joined with Unite Here 100, will rally for food service worker retention, supporting a bill that expands upon the 2002 Displaced Building Service Worker Protection Act to include food service workers from being fired from work after a new owner takes over a business. A Council hearing will take place at 1 p.m.
On Monday at 2 p.m., Gov. Cuomo will be at the Jacob Javits Center to participate "in New York State's Annual Thanksgiving Food Donation Drive with volunteers and members of the New York National Guard." At 6 p.m. Monday, New York City Comptroller Scott Stringer’s Red Tape Commission will hold a Staten Island hearing for business owners and entrepreneurs, part of the ongoing initiative to remake the government into a partner to businesses instead of being an “obstacle to growth”. Also at 6 p.m. the Brooklyn Borough President Eric Adams will hold a public hearing on East New York community planning. At 10 a.m. the Committee on Finance will meet on a variety of topics. At 1 p.m. the City Council Stated Meeting will be held - and as usual, it will be prefaced by the Speaker’s pre-stated press conference, at 12:30 p.m.
On Tuesday, "Mayor de Blasio and First Lady Chirlane McCray will appear live on CNN's New Day to discuss ThriveNYC: The Mental Health Roadmap for All," at about 6:50 a.m. Later in the morning, "the Mayor will create and deliver food packages with Joel Berg of NYC Coalition Against Hunger." At about 11:45 a.m., "the Mayor will deliver remarks on hunger and food insecurity in New York City." At about 4 p.m., "the Mayor will join bi-partisan local elected officials – including Westchester County Executive Robert Astorino, Congressman Jerrold Nadler, Congressman Dan Donovan and Congresswoman Nydia Velázquez – to host a press conference to highlight the need for increased federal transportation funding as New Yorkers prepare for holiday weekend travel." On Tuesday, November 24th, Council Member Andy King will offer Free Healthcare Enrollment and Legal Services to Bronx Residents. In cooperation with MetroPlus and New York Legal Assistance Group the event will help residents sign up for health care and legal services. At 10:30 a.m. Tuesday, Comptroller Scott Stringer will deliver remarks at "NYC Coalition Against Hunger Annual Flagship Event." On Tuesday at 7 p.m. Public Advocate Tish James will host an African Immigrant "Talk to Tish" Town Hall in the Bronx; and at 8:30 p.m. James will attend the Bayside Hills Civic Association General Meeting in Oakland Gardens. On Tuesday evening in Brooklyn, school district 15, which includes parts of Sunset Park, Kensington, Park Slope, Carroll Gardens, and Red Hook, schools Chancellor Carmen Fariña will hold a town hall "from 6:30 to 7:30 p.m. at P.S. 516...Local elected officials including City Councilman Carlos Menchaca, Assemblyman Felix Ortiz and State Sen. Jesse Hamilton are expected to attend and answer questions from the public from 7:30 to 8:30 p.m.," according to DNAinfo. Happy Thanksgiving if you’re celebrating. Watch for our latest articles this week and we'll publish a 'Week Ahead' on Sunday, Nov. 29.